From Odd to POD – we have it! 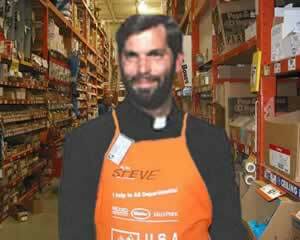 Hi I am Father Steve and I am here to make your shopping at The Rome Depot a blessed experience. Here at The Rome Depot – prices are so low you will feel like going to confession for stealing! All of our staff are professional and will greet you with a smile and a immaculate reception. Whether you have been there from the cradle or are a convert we have shelves and shelves of everything you need to piously outfit yourself and your house. From Alpha to Omega, if we don’t have it we will order it. Check our our daily specials below. 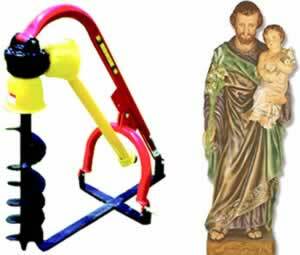 The ultimate in hi-tech cool Catholic gadgets. 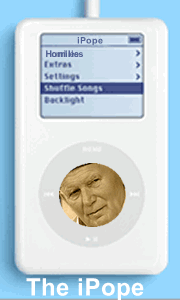 The iPope contains a 20mb hard drive with more than enough room to store all of the Pope’s Wednesday audiences. Sign up with our new iHomilies service and download new sermons for only 99 cents with spoken encyclicals for only $4.99. Sync up homilies on your home computer with the included USB (Ultra Sacramental Bus) cable. Our patented dial will have you selecting your favorite speech to listen to in no time. You can choose to listen by theological topic or random play. You can’t truly call yourself a Catholic Nerd unless you own a iPope. Get connected and be not afraid. From our new line of G.I. 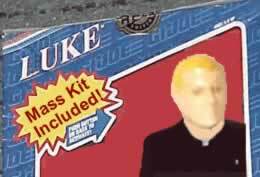 St. Joe action figures we have Father Luke the chaplain. Your kids will have hours of fun saying Mass for the troops hearing confession in the field and giving Extreme Unction to fallen Joes. Includes kung-fu grip so that he never drops a Communion wafer. Follow the Pope’s advice and “breathe with both lungs” of the Church when you go scuba diving. One tank is filled with an oxygen/nitrogen mix of Roman air and the other an oxygen/nitrogen mix of Eastern air. Introducing new dermatologist approved Chrism Oil for those with sensitive skin. Guaranteed to be hypo-allergenic. Also available with new fresh sacristy scent. Lavabo -The first word of that portion of Psalm 25 said by the celebrant at Mass while he washes his hands after the Offertory, from which word the whole ceremony is named. Do you still have palm branches from a Palm Sunday Mass 20 years ago and just don’t think it is right to just toss them in the garbage. Do you have drawers full of worn out scapulars? Normally blessed items should either be burned or buried to be properly disposed. 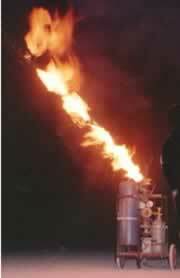 For big jobs we have the RD-500 Sacramental Flame Thrower. It is both fun and fast to dispose of your sacramentals. $349.99 while supplies last. If you live in an apartment or somewhere with limited space the try the RD-250 propane sacrament elimination system safe for indoor use. Do you have a small or big construction project and want your cement to be pious also. Introducing new Convert Cement which is made from sediment dredged from the Tiber River. Great for driveway construction so that every time you come home you will be crossing the Tiber. This double reinforced steel entry door will give you all the protection that you need. This door will not only protect you against hurricanes and other storms, with the embedded St. Benedicts’ medal it may also help to protect you from spiritual forces such as Satan (void where prohibited). On the arms of the cross are the initial letters of a rhythmic Latin prayer: Crux sacra sit mihi lux! Nunquam draco sit mihi dux! (May the holy cross be my light! May the dragon never be my guide!). Whether you are a closet Dominican or a full fledge book addict – we have just the books for you. Including Bibles, Catechisms, Spiritual Reading, Holy Cards, and Prayer Booklets. Each store has two full aisles reaching to the ceiling. Don’t forget to stop by the bookshelf aisle for all the furniture needed to maintain your addiction. During Easter Mass and at other times the People are sprinkled with Holy Water (aspersion). We have just the equipment for every need. 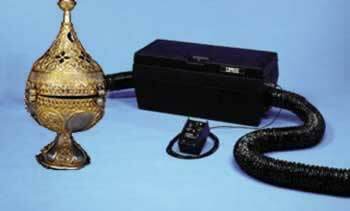 We have available Holy Water Sprinklers & Pots. 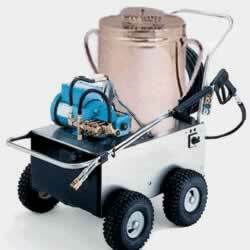 Or to really soak down the congregation we now offer the heavy duty Holy Water Pressure Sprayer rated at 3000 psi. This will ensure that everybody in the congregation will be adequately sprinkled without you having to throw your arm out! Not limited to just the Church, this Holy Water Pressure Sprayer will have your house spiritual and physically clean in no time. You have seen those cheap foreign St. Joseph Statue Kits for selling your home in other Catholic Book stores. But why do things only with half measures? Our kits comes with a full 5′ foot statue of St. Joseph and a coupon to rent one of our post hole diggers. You will have St. Joseph buried upside down in no time and interceding to sell your house. Do you have some heavy lifting to do? 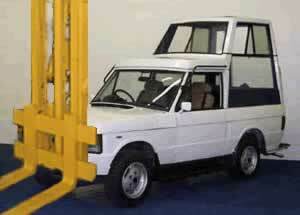 Then do it in style by renting our Popemobile Forklift. The person stationed in the bubble zone can easily see in all directions to act as a safety observer. Besides, admit it – you have always wanted to be driven down the street in a Popemobile waving at passerbys. Besides all the supplies and equipment you need we also offer you workshops to teach you how to do it yourself. 10:00 – 11:00 Build your own reliquaries. Learn how to custom make cases to fit those relics you have. 11:00 – 12:00 Build your own Prie-Dieu. This class will have you kneeling in no time. 12:00 – 1:00 Outfitting your home chapel. Learn what are the best woods to use and what materials are best to prevent fires started by votive candles. Get your own Rome Depot credit card where rates are guaranteed not to be considered usury. Five percent of each purchase charged is donated to the poor. All charges are forgiven during Jubilee Years. In the meantime, nonpayment could lead to excommunication. I nearly died laughing. What a great start to the day! Just shared this with my dd – ROFL!!! Hilarious – but then, I actually really liked the front door…. My goodness. I read most of this to my son, and he said “It’s great being Catholic”. I enjoyed it immensely. Thank you. Thank you. What aisle is the pro-life stuff (table leaves, bunk beds, shed kits for all the bikes and stuff?) Also we need glue for our marriage and some fine and course sand-papal for some rough edges we have in our life! Anyone with a blog or a website can add a link for The Popes Cologne and earn commissions. Then sit back and receive commission checks for doing nothing ! I’ve got to share this with one of the Priests at my parish – I know he’d LOVE the Holy Water Pressure Sprayer! I love it. I giggle, until I see something I actually really like….and would buy. I too think that the front door is great. i think i just peed on my pants,giggling! will tell my friends about this hillarious site. Too funny! Thank you for the laughter, it is much appreciated! For the straight & narrow, i have applied for a patent for a spiritual GPS (God’s Positioning System). This device will give out instructions for a route to heaven and it comes with a voice output from an auto recalculating subsystem that is activated when one strays from one of many designated routes to redemption, conversion and salvation. The feed comes from any one of many geo-synchronous spiritual satellites that have been calibrated according to the three paths of holiness: the purgative, the illuminative, and the unitive pathways. Reading Supplies. Love books but the wife won’t let me use the other bedroom for a library. She says “you got ‘nough books already”. Our government’s friendly EPA has released the latest rules for The Sacramental Destruction System.on its correct use so that a $10,000 fine or 50 years in Alcatraz can be avoided. The flame must not harm even just one blade of grass or leaf. Loss of home okay but no a helpless lovable plant. Father Steve please had teacups ’cause I got rid of my coffee cups and of course Lipton tea bags.